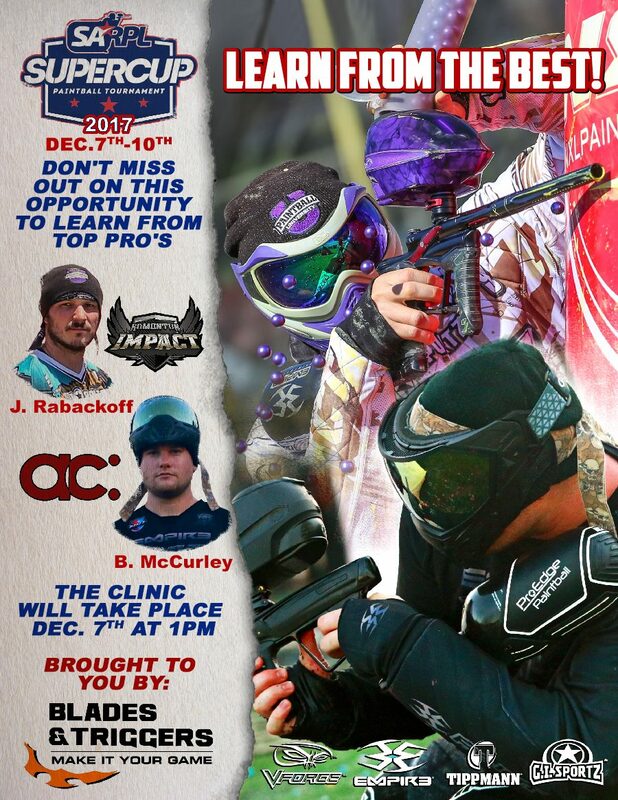 The 6th annual Paintball Super Cup for 2018 will take place from 6-9 December 2018 at Emerald Casino and Resort, Vanderbijlpark, Gauteng, South Africa. Make sure you are part of this years international paintball event which will include both 3-man and 5-man Xball formats as well as the African Confederation Cup. Please remember to use RATE CODE: Paintball to qualify for the special rates. or complete the online booking request for assistance from our side. Paintball Super Cup 2017 is around the corner and will take place from 7-10 December 2017 at Emerald Resort & Casino, Vanderbijlpark. Here is a rough overview for players/spectators to take note. The fields are setup at the Emerald Resort Conference Centre which is right next to the river on the Chalet side of the venue. At 12pm the Super Cup Registration area will open where players will be able to sign in, collect any pre-orders, get their cylinders checked, pay/renew for their season fees, collect new SARPL player cards, reprint cards etc. At around 6:00pm we would like to do a official opening ceremony with teams joining us for a live webcast. 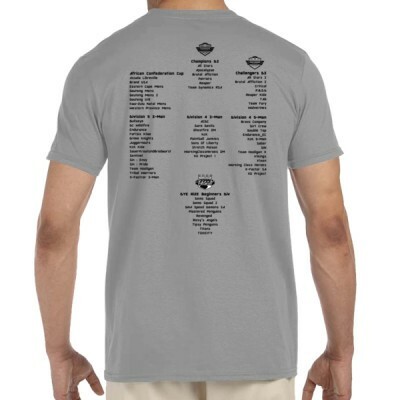 Teams/players are requested to wear their team gear. Straight after the opening ceremony there will be a meeting with team captains about the rules and other important information relating to the event. Friday – Sunday will see the games on both the 3-man and 5-man according to the schedules, but games will commence most days around 7am and will run till around 6pm on the 5-man field. Order your Super Cup 2017 T-Shirt to make sure you get the size you are looking for. Make sure you don’t miss out on this years pro clinic with Justin Rabackoff (Edmonton Impact) as well as Brad McCurley (ac:Dallas) hosted at SARPL Super Cup 2017, Emerald Resort & Casino and brought to you by Blades and Triggers and GI Sportz. 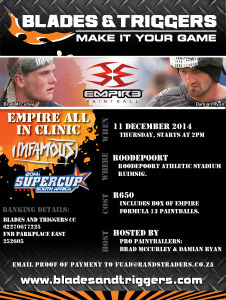 Make sure you register for this years Pro Clinic at Paintball Super Cup 2014 on Thu 11 Dec 2pm that will be presented by Brad McCurley and Damian Ryan from team Infamous. Thanks to Blades and Triggers and Empire Paintball. 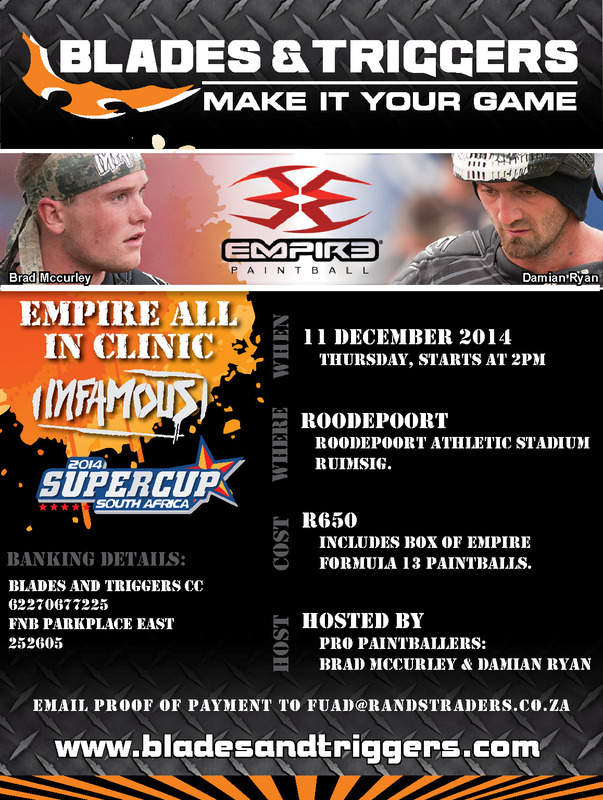 Cost: R650 per person and includes a box of Empire Formula 13 paintballs. 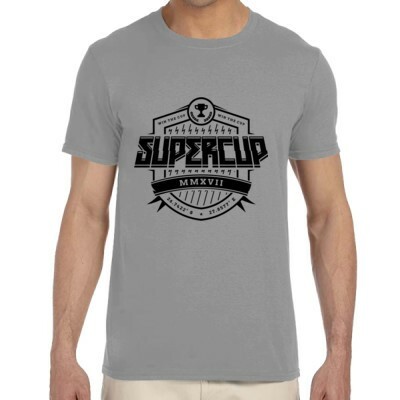 2013 saw the premier of Super Cup, an annual paintball event on a national scale. The setting for the first event was the beautiful Forever Resort Gariep and was selected for its location in the middle of South Africa. The weekend of the 6-8 December saw over 50 teams competing in two different divisions in both the 3-man and 5-man formats. The 3-man format saw a total of 32 teams from across South Africa and Namibia competing in two divisions (Div4 and Div5), while the 5-man format saw a total of 20 teams from across South Africa competing in two divisions (Div3 and Div4) to see who would be crowned the national and provincial winners. We were also privileged to have American PSP Pro team Houston Heat attend the event , along with Dynasty Pro player Ryan Greenspan and Ex-Joy Division Pro player Maximus Lundqvist. Houston Heat played a series of exhibition games against local teams in an open challenge of Friday and Saturday. International media included Rody Huibers from RSH Media (Netherlands) as well as Joel Pitra from Social Paintball (America) and Ryan Kenny from RK Productions (America).